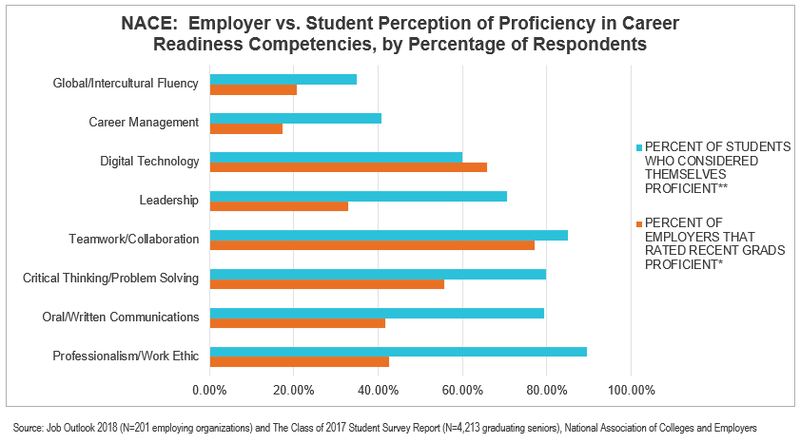 When it comes to measuring how well-prepared today’s graduates are for success in the workplace, perceptions vary widely especially when you compare those from employers, academic institutions and the students themselves. Because of this, many workforce leaders are pointing to the need for increased collaboration between the academic and business worlds. Major attention was first brought to this issue following a study reported on Gallup’s blogspace in 2014 by Gallup and The Lumina Foundation. “A whopping 96% of chief academic officers at higher education institutions say their institution is “very or somewhat” effective at preparing students for the world of work. That’s an awful lot of confidence, considering how U.S. business leaders and the American public judge higher education institutions on this same measure. Gallup found that a mere 14% of Americans strongly agree that college graduates are well-prepared for success in the workplace,” states the blog author. In a more recent study, Building Tomorrow’s Talent: Collaboration Can Close Emerging Skills Gap by Bloomberg Next and Workday, professionals from business and academia say that college graduates are not well-prepared for today’s professional environment, primarily because of insufficient soft skills. Survey respondents from both groups agreed the most important soft skills are teamwork, analytical reasoning, complex problem-solving, agility, adaptability, and ethical judgment. But respondents also said that new recruits are not meeting expectations in many of the soft skills that they consider the most important such as emotional intelligence, negotiation and persuasion, and, complex reasoning. Why are these soft skills so important in today’s digital workplace? According to the McKinsey Global Institute research, the rise of automation, AI and advanced technologies are driving major changes in the skills people need to succeed. But those skills are not just digital. New technologies require people who can “understand how they work and can innovate, develop, and adapt them,” and this means finely tuned social and emotional skills and a higher level of cognitive skills such as creativity, critical thinking, decision making, and complex information processing. It’s clear from both the “Building Tomorrow’s Talent” study and the NACE research that hiring organizations and higher education institutions still need to collaborate more effectively to prepare students for employment. A new collaboration launched recently by SkillSurvey and the NACE Center for Career Development and Talent Acquisition begins to address the gap by providing higher education organizations and their career services teams proven HR tools that have been used by employers in their hiring process for millions of job candidates. More than 60 institutions have now signed on as founding members to the pilot project and will be able to use SkillSurvey’s online technology to obtain feedback on students’ post-work and internship experiences. There are eighteen unique post-experience surveys created by I/O psychologists on SkillSurvey’s analytics team that align with the eight key competencies defined by NACE. With this pilot program, career services centers and other departments will be able to assess how their student employment and internship programs are preparing students with a consistent, easy to use process that will produce uniform data that will allow colleges and universities to benchmark their students’ performance. Institutions will be able to obtain comparative data to see how their students measure up against other students nationally and along with real entry-level candidates in similar roles to monitor progress and improvement. Learn more about The Career Readiness Project.